You don't need caviar to make a fancy oceanic dish. 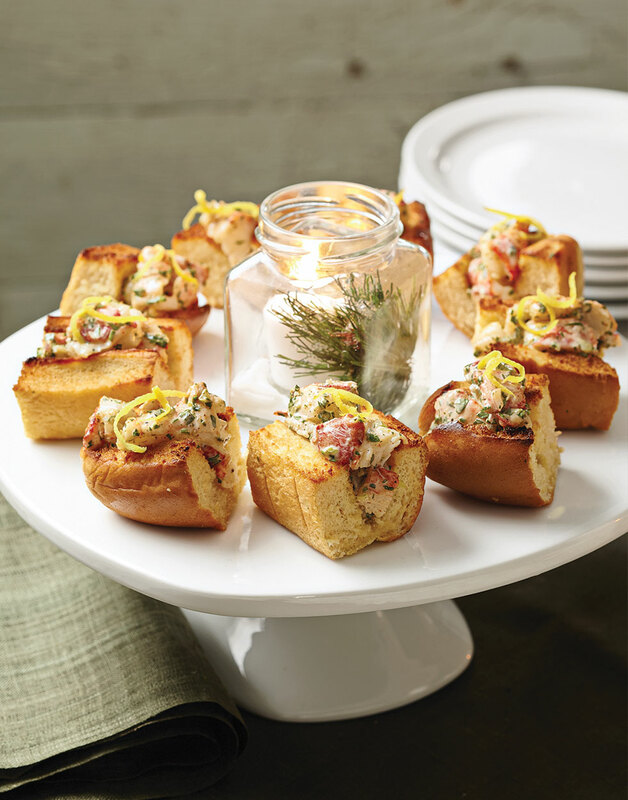 This Mini Lobster Rolls recipe is sure to be a "crustacean" sensation at your next party. And while lobster tails are more affordable than buying whole lobsters, you can also substitute lobster tails for one pound of shrimp. For the rolls, skewer each lobster tail lengthwise through center of tail with a wooden skewer to prevent curling during steaming. Combine water, juice of 1 lemon, and 1 tsp. Old Bay in a large saucepan. Insert steamer basket in pan, bring water to a boil, place lobster tails in steamer, and cover. Steam tails until shells are red and meat is cooked, 8–10 minutes. Remove tails from pan and cool slightly. Cut shells lengthwise with kitchen shears. Remove skewers and meat; chop meat into chunks. Preheat broiler with rack 5 inches from the element. For the mayonnaise, mix mayonnaise, celery, chives, tarragon, parsley, shallots, 2 tsp. lemon juice, ½ tsp. Old Bay, salt, black pepper, and cayenne in a bowl. Fold in lobster meat. Brush rolls with melted butter and broil until toasted, 1–2 minutes. Spoon filling onto toasted rolls and garnish with reserved lemon zest. Using kitchen shears is a safe and effective way to easily cut through tough lobster shells. To create appetizer-sized lobster rolls, cut the hot dog buns in thirds before broiling them.